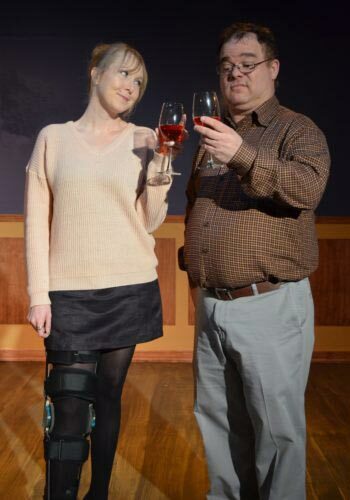 Chelsea Davis stars as Senga and Daniel Willsey as Ever in “Dancing Lessons,” a romantic comedy by Mark St. Germain. Carpenter Square Theatre is now taking reservations for shows playing January 11-26. Call 405-232-6500 or email csttix@coxinet.net for reservations. 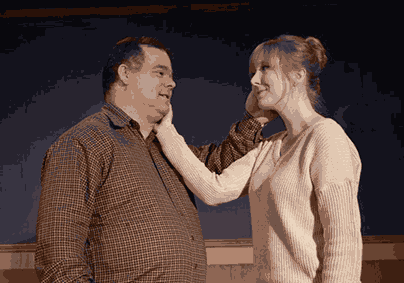 Carpenter Square Theatre is presenting Mark St. Germain’s lightly romantic comedy “Dancing Lessons” through January 26, 2019. The play tells the story of two extraordinary people, one, a successful scientist with autism and the other a successful but injured dancer. The two person show is set in the apartment of the injured dancer, Senga Quinn. Her severely broken leg requires a dangerous operation and no surgeon will undertake to operate. She fears she will never dance again. Another resident visits, asking her to give him a single dancing lesson for a very large fee. He is a scientist named Ever Montgomery. In his career, he has managed to overcome his autism, but he is unable to tolerate social contact—especially involving touch. He is being honored with an award at the annual awards ceremony which will entertain dancing. If Ever can convince Senga to get him through one fast dance, he will be very relieved. As the play progresses Ever begins to overcome his fear of contact and Senga begins to face the obstacles she needs to overcome. This is a sensitive play, delving into the severe difficulties autistics face handling basic situations. But it is also a play about the severe difficulties that emotional problems can create. The two both have straightforward problems, physical handicaps that must be corrected or overcome, but life is much more complicated than that—and some obstacles are hard to identify. In “Dancing Lessons” Senga (Chelsea Davis) accidentally falls, but Ever (Daniel Willsey) cannot bring himself to touch her in order to help her up. Carpenter Square is located at 800 W. Main in downtown Oklahoma City. Call 405-232-6500 or email csttix@coxinet.net for reservations. Tom Cowley directs two splendid actors in “Dancing Lessons” both making their debut at Carpenter Square. Daniel Willsey as Ever Montgomery plays the role sensitively and squarely. Chelsea Davis handles the role of Senga Quinn with a dancer’s grace and an actor’s intelligence. They are both welcome additions to the Carpenter Square community and will hopefully continue to appear throughout Oklahoma City. Working with Cowley is his wife, Linda Cowley who contributes as rehearsal stage manager while Mark Fairchild is production stage manager. One of the most amazing aspects of “Dancing Lessons” is the humor. Sometimes subtle, it is always there and the actors do a fine job of exhibiting their sense of humor, and the audience responds with intent. Secondly, these character’s display the extraordinary courage that is required to overcome the curve balls that life throws delivered with sincerity by Davis and Willsey. The Carpenter Square Lobby is a gallery displaying art works from various local artists. For “Dancing Lessons” the art work is all women artists coming into their own. It is a fascinating display and although each artist is different they all are perfectly apropos for the play. Featuring the lovely oil work of Corrie Reagan revealing self-portraits conveying, if not mirroring, the expressions of Davis as Senga Quinn, visitors viewing the art work at intermission are immediately struck by the power of her work. Kylie Combs displays wonderful and interesting work that is a more subtle reflection of “Dancing Lessons” while Jael Wisdom Zumwalt displays work that is definitely unique. Kristina Haden aka StinaHart reveals the feminine struggle of acceptance powerfully in her work and Hannah Leggett aka Hel2 the Artist is possibly more accepting of her feminine self, but more demanding of attention. Julie Yang’s work is also extremely interesting and competent. These works are from some of the best up and coming young artists who happen to be women, and there is art displayed to appeal to every taste—but each artist makes a relevant statement with use of great imagination and talent. Chelsea Davis stars as Senga and Daniel Willsey as Ever in “Dancing Lessons,” Call 405-232-6500 or email csttix@coxinet.net for reservations. “Dancing Lessons” is playing at Carpenter Square Theatre through January 26, 2019 at 800 West Main in downtown Oklahoma City. For tickets and information visit www.carpentersquare.com or call the box office at 405-232-6500 1:00 to 6:00 pm Tuesday through Saturday. The curtain is 8:00 pm and there is a bar and concessions in the theatre that is open prior to the curtain and during intermission. “Dancing Lessons” is certainly one show that should be in the must-see category.